Travelling through the Stellenbosch valley over Helshoogte to Franschhoek one comes across the little village of Pniel clinging to the mountain side. It was established way back in 1834 when the slaves in South Africa were emancipated. A philanthropic organisation at the time was concerned with the well being of former slaves who had no fixed abode and purchased land where a mission station was founded in 1843. The United Congregation Church was built on this land and is still used by the Pniel community today. Rev. Johan Frederick Stegman was the first missionary of Pniel, and served his community from 1825 to 1910. The village is surrounded by mountains, vineyards and orchards. The Dwars river runs through it on its way to the Berg River. Pniel used to be an agricultural village but today has grown into a large fruit and vegetable supplier. Most of the village's income comes from this source. The main road through the town is narrow and winds its way along the mountainside. On either side of it the houses of the villagers can be seen. The small cottages are close to the road so traffic has to travel slowly through the village. The cemetry is built on a slope just outside the village and many of the graves cling to the steep slopes. Sport forms an important part of the social life of the community of Pniel. A sports complex has been built close by and in the summer months cricket is played while in winter rugby is the main sport. Pniel is ideally situated for walking or cycling. 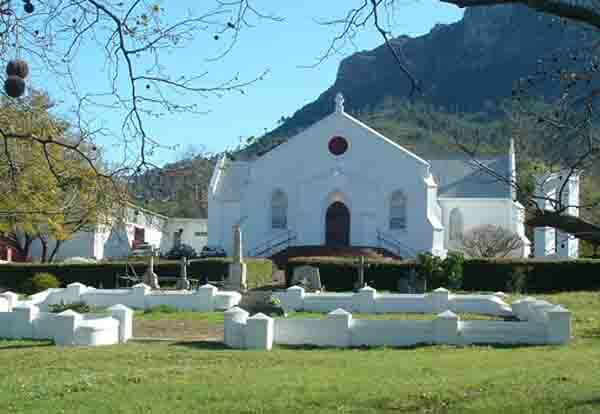 The Boschendal wine estate is within walking distance of the village and one can do wine tasting on the estate. Franschhoek and Pniel are favourite haunts of pigeon racing enthusiasts. Surrounded by high mountains the terrain provides a stern test for pigeons released in the area. Pniel is not one of Cape Town's greatest tourist attractions but a drive through Helshoogte Pass from Stellenbosch will take you through this quaint farming village where life has a much slower pace than that of Cape Town.